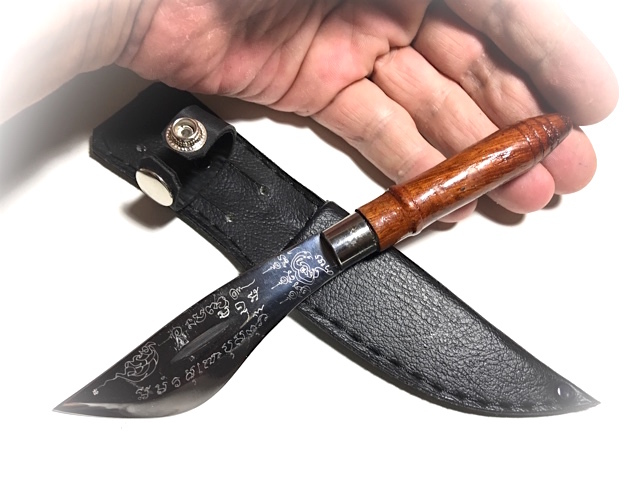 The Mitmor is a ritual knife magically empowered, and often alchemically forged, and sheathed using sacred substances such as ivory, sacred treewoods, and other substances. 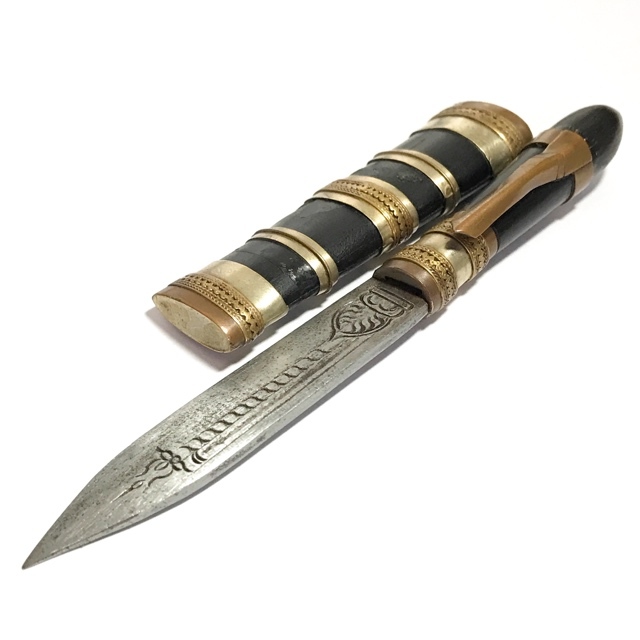 Mitmor knives are used for Ritual Magick, Carrying for Protection and Good Fortunes, and for Altar Worship for Bucha, to pray to for Blessings. 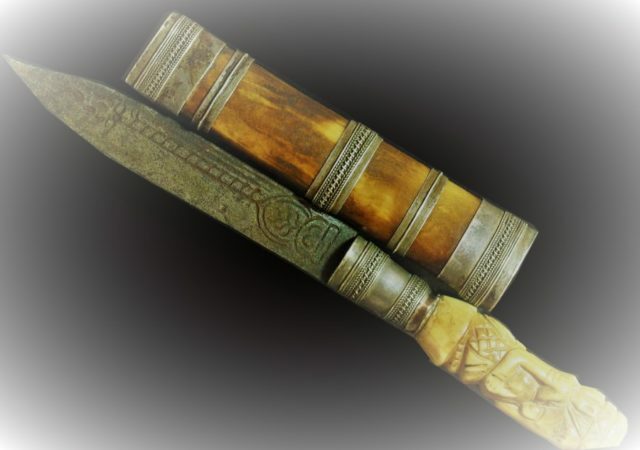 But the Mitmor, is also a kind of Magic Wand, Sceptre of Command over Spirits and Ghosts, and a hence, a Ritual Weapon much like the Athame in Wicca, to Banish Evil Spirits and Nullify Curses. Mitmor are used by the Masters to perform Inscriptions on the devotees, or upon inanimate objects, to invoke magical spells and bestow blessings. 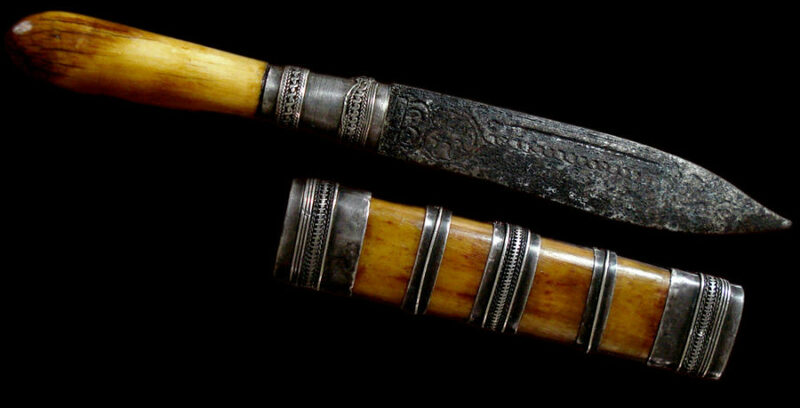 The Mitmor can be used to stir and empower prayer water, whilst performing incantations for whatever kind of blessings one may seek to invoke, be they Kong Grapan Chadtri Klaew Klaad, Maha Lap Maha Pokasap, Jerajaa Khaa Khaay, or Metta Maha Niyom Maha Sanaeh. You can use Buddhist Prayers and Candles to perform Holy Water Making, and stir the water in a clean clear bowl with clean clear water in it. Raise the Mitmor above your head, and chant, whilst lowering it slowly to point towards the ground whilst facing the West. This Kata can also be used to stir holy water and bless it with healing powers. The water can be used to drink yourself, or give to others to drink, or to spray devotee with (or yourself), to heal. Take the Mitmor knife and tap the crown of the head, and focus on Banishing the Demon or Magick. Or immerse the Mitmor and stir clockwise whilst chanting and evoking the intention to Banish Dark Magick. Na Moe Put Taa Ya (repeat 108 times). Take the Mitmor pointing Downwards over the head of the grave of the spirit who is running amok, or who you wish to bind and prevent from fleeing until you have finished your discourse with the spirit, and wave the Knife pointing at the sky then moving down in front of you with outstretched arm to point at head of grave, and Chant “A”, and stick the knife in the earth. You can do the same in reverse for adept purposes (Ajarn Spencer leaves this purpose unrevealed). So the Nine Point Incantation to bind a ghost within the grave, or coffin, would be to step sideways along the grave performing the ritual movements and inserting the blade in the surface of the earth with these 9 Syllables, one syllable per point of insertion of the blade. 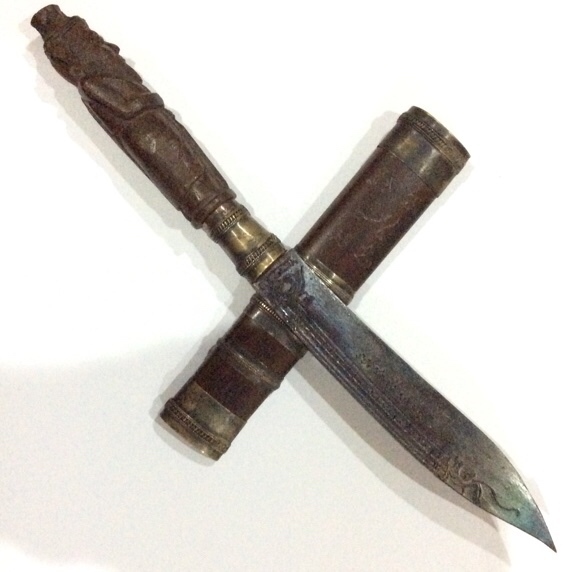 This is used by Necromancers either to bind a ghost who is haunting the area, or before opening a grave and coffin to extract Nam Man Prai Oil from the corpse, to stop the spirit with its immense psychic powers from rushing out of the coffin and attacking the Necromancer. Each syllable below should be chanted as you insert the knife into the earth. There are a myriad of uses of the Mitmor, which are currently being further documented for publication on this page as we are able to add more content. 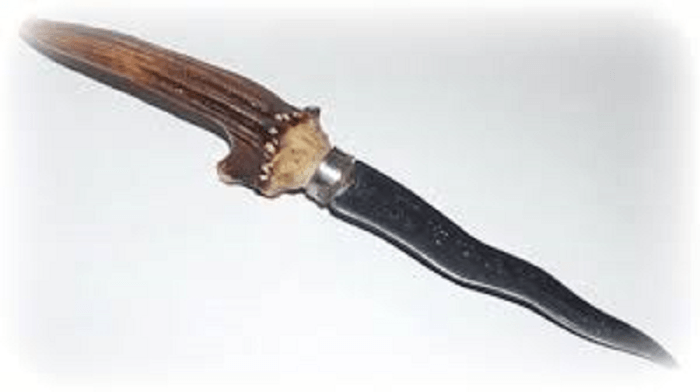 Mitmor can be utilized as a Protective Amulet, or as a Ritual/Ceremonial Instrument for various methods of Magical and Spiritual Practice, such as making Holy Water, Blessing Devotees, Exorcizing Ghosts and Demons, and Empowerment of Inanimate Objects.